LASIK can also help treat presbyopia, or the need for reading glasses after the age of 40. 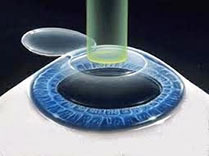 This type of LASIK is known as monovision LASIK. Read more about this exciting alternative to reading glasses here.